To understand their role in our urban history, we need to take a step back in time and look at the origins of bottle shops in colonial Melbourne. From the licensed grocers and wine merchants in the 19th century to the “big box” suburban outlet we know today, the evolution of the “bottle-o” reveals broader contentious relationships between regulation, urban form, consumption and liberal ideals. Since its establishment as a colony in the 1830s, Victoria has always had a licensing system for alcohol sales, including off-premises or takeaway sales. Bottle shops have always had their own licensing conditions: sealing, size rules, not reusing bottles, not consuming near the premises. In 19th century legislation, licensed grocers were allowed to “sell and dispose of liquor in bottles containing not less than a pint and in quantities not exceeding two gallons and…not to be drunk in or near the house or premises in which such liquor is sold”. The anti-alcohol temperance movement, which became prominent in the 1880s, culminated in many changes to alcohol regulations. These included early pub closing times adopted as a patriotic measure during the First World War. 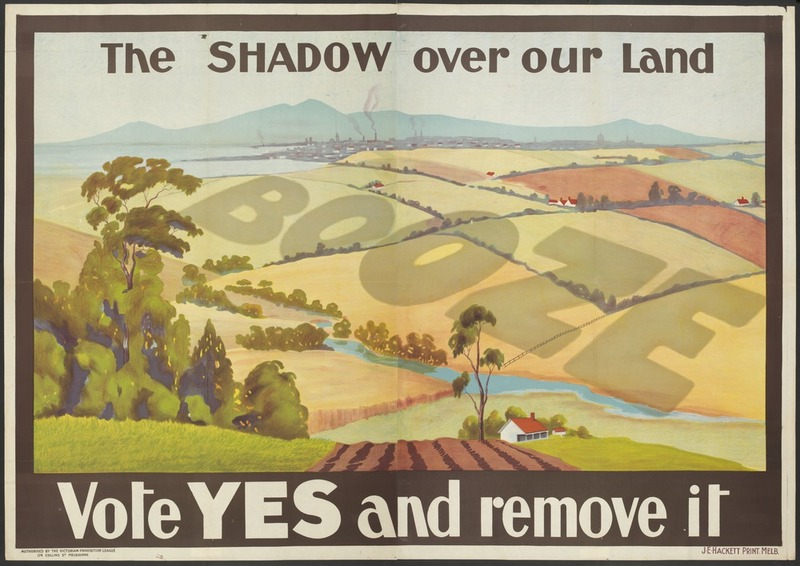 This 1930 temperance poster refers to the Local Option Poll which empowered the Licences’ Reduction Board to reduce the number of licenses to sell alcohol. (Photo: State Library of Victoria). 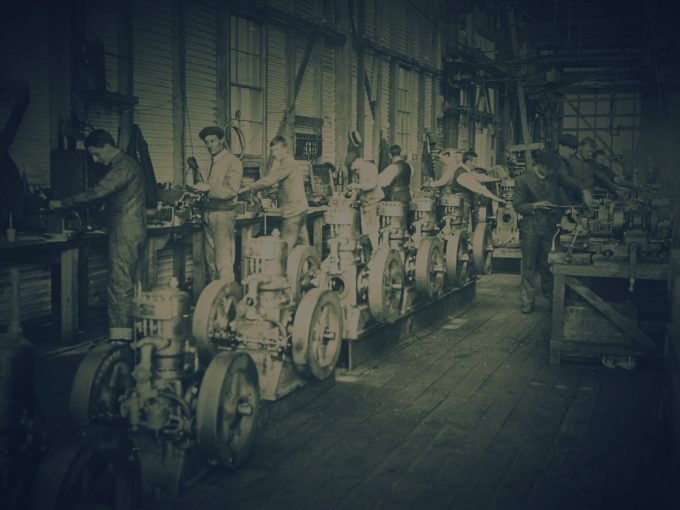 The movement had an intense impact on Australian pubs, including their industry structure and drinking cultures. The “six o’clock swill”– the crush of heavy drinking by men in public bars between 5pm knock-off and 6pm closing – was to define a utilitarian Australian drinking culture for decades after WWI, and in Victoria until the late 1960s. Greater government controls accompanied the decades of the swill, characterised by general stasis in an industry of powerful but intricately regulated hotels. Liberalisation of liquor laws from the late 1960s to the mid-1980s saw the spread of bottle shops, including those occupying storefronts, ones adjacent to hotels (with the stipulated separate entrance door), as well as the newer drive-in bottle-o. There was also growth of supermarket-associated liquor stores like Liquorland through the 1980s, but this was constrained by “the 8% rule” – a state-wide ownership cap that restricts a person or corporation from holding more than 8% of the total number of packaged liquor licences. From 2000, major supermarket ownership of large format “big box” liquor stores has increased rapidly, but also seeded renewed debates. Caption: ‘Big box’ franchised bottle shop, Brunswick. (Photo: Elizabeth Taylor, 2018). These include tensions around relationships between alcohol and driving, problem public drinking versus aspirations for civility, and fears around links between liquor outlets and violence. For example, concerns about the proliferation of large format bottle shops and their links to domestic violence were central to Victoria’s Hunt Club case in 2013. Local council and community representatives wanted to restrict the proposal for a large-scale liquor store in Cranbourne expressing concern about the concentration of large corporate bottle shops in outer suburban areas, and their potential links to domestic violence. 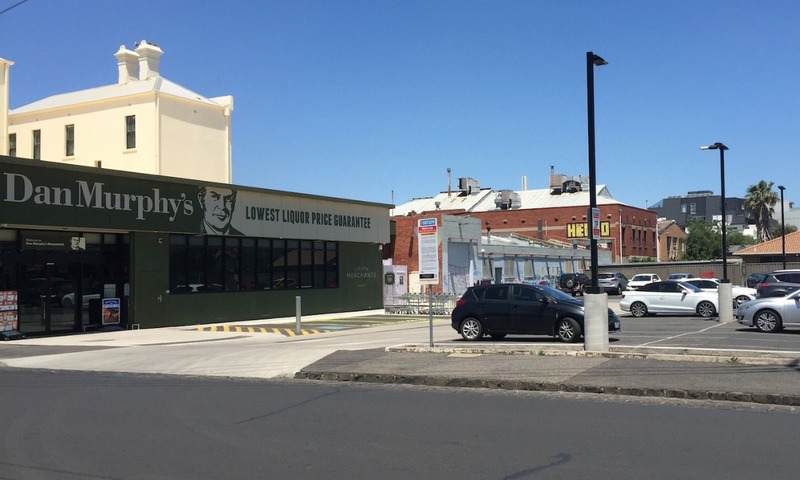 Planners seek to regulate the harms associated with takeaway alcohol sales but ironically, the big, suburban, car-oriented and corporate bottle shops of today are themselves the products of planning requirements over the 20th century that emphasised separation from residential areas and the provision of car parking. While temperance anxiety has often focused on closing or limiting hotels, takeaway alcohol now accounts for the majority (80%) of alcohol sold in Australia and private liquor consumption is more normalised. Outlets no longer stock only the iconic chunky “flagon” and a small range of big brand beers of decades past. Yet the ever-renewed focus of regulation and anxiety still exists. In the conditions placed on bottle shops there has always been a tension between social anxiety over the derelict “wino” (holder of paper bags, dweller on park benches) and our aspirations to civilised European drinking practices. Bottle shops are sites closely shaped by regulations, in turn reflecting and reinforcing changing norms and fears about alcohol consumption. In times of fear, they acquire extra layers of narrative-based controls – Sydney’s ‘lock out’ rules, for example, which limit packaged sales after 9pm due to concerns about violence – even if the effects are sometimes contrary to intentions. As with swill pubs and the effects of early closing, bottle shops in Australia demonstrate the often-unanticipated effects of regulations. Governments typically walk a fine line between the contradictions of profiting from, and attempting to control, alcohol. Liquor regulations too, are a blurry line between control and creating insider trade interests. Ross & Smith Family Grocers / Wines / Spirits, Gertrude Street, Collingwood 1861 (Photo by Davies & Co., State Library of Victoria). Today as during the temperance era, the root causes of violence defy easy explanations—or at least solutions. In the absence of them, alcohol seems as likely as anything to be put forward, particularly when bundled with broader social anxieties. 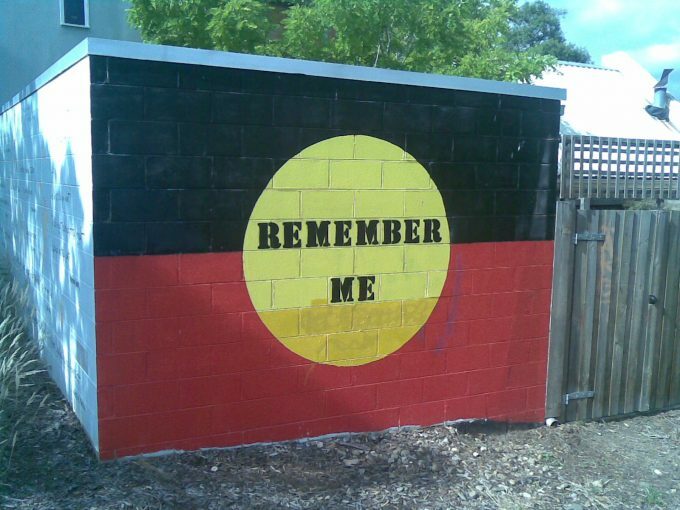 There is renewed controversy over public drinking and local laws restricting it – for example in response to ‘incidents’ at St Kilda beach. As long as there have been calls to restrict alcohol, there have been concerns about the impacts on personal freedoms—and vice versa. 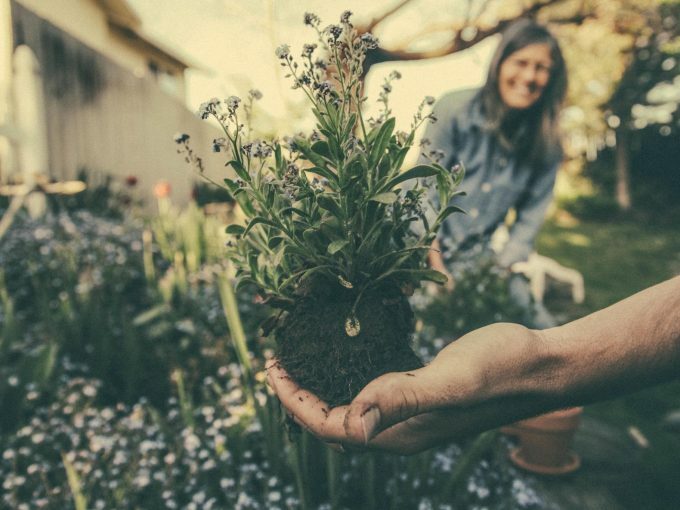 Reflecting on this past contains lessons for policy today, with temperance ideas still recognisable in the ways cities like Melbourne are organized and the ways problems are understood. Even where regulations respond to a real issue and seem to control something, history (as in bottle shops) shows us the effect is not always as intended. Regulations aimed at containment are rife with unintended consequences—good, bad, and occasionally baffling. Tiled, boxed, separated, timed –looking at the history of bottle shops, and the deceptively mundane regulations that continually shape them, reveals stories of broader conflicted relationships between regulation, urban form, consumption, and liberal ideals. 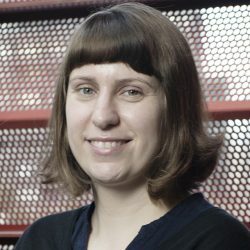 Dr Elizabeth Taylor is a Vice-Chancellor’s Post-Doctoral Research Fellow in RMIT’s Centre for Urban Research. 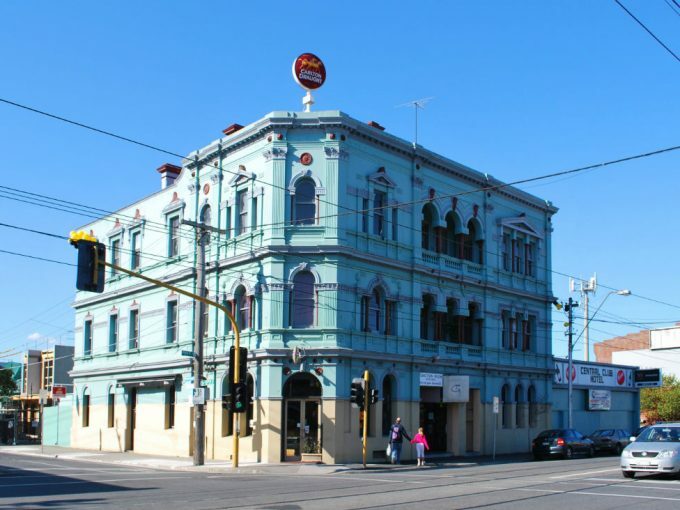 She will be launching her new book Dry Zones: Planning and the Hangovers of Liquor Licensing History at South Melbourne Temperance Hall on Friday 8 February 2019. Register to attend. 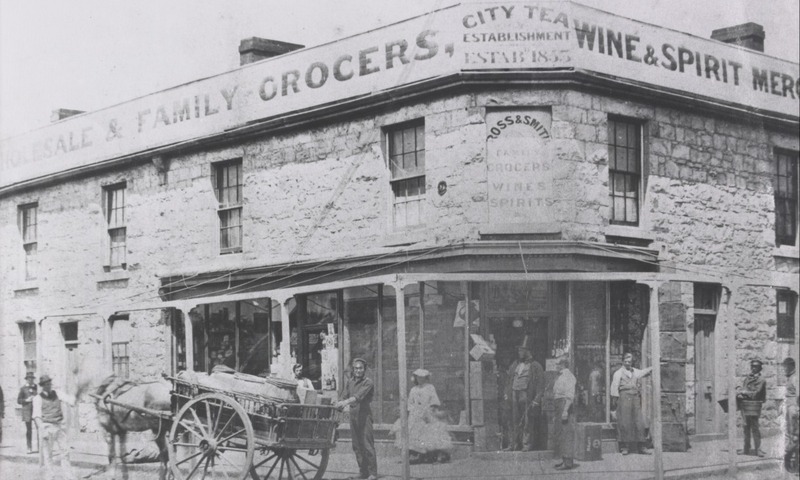 Header image: Exterior of a colonial wine store, 1890 (Photo from John Etkins Collection, State Library of Victoria).